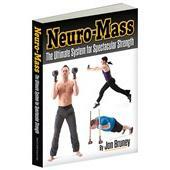 Strongman and Neuro-Mass author, Jon Bruney, specializes in blitzing the body with special combinations of grinds, isometrics and explosives. Jon calls them Neuro-Sets. 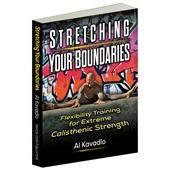 When performed with proper intensity and in the correct sequence, Neuro-Sets put your system into neural overdrive—and they explode your strength. 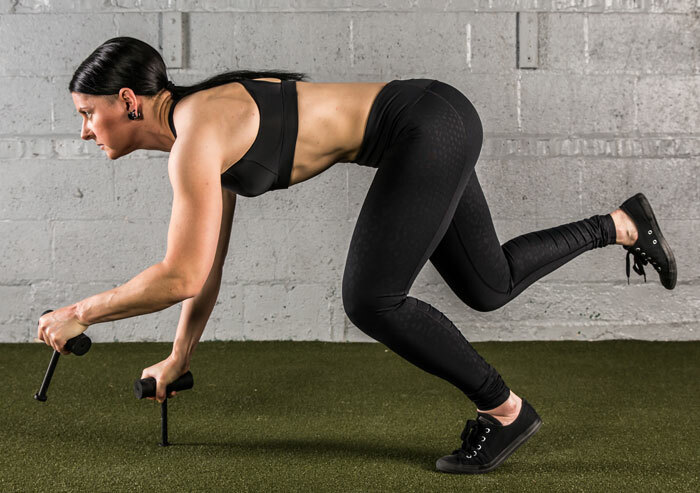 When choosing an exercise for a Neuro-Set, Jon looks for what will place the greatest possible demand on his muscles—then savagely attacks with every ounce of effort. The concept is: “what can make this harder?” The practice is: to DO IT. 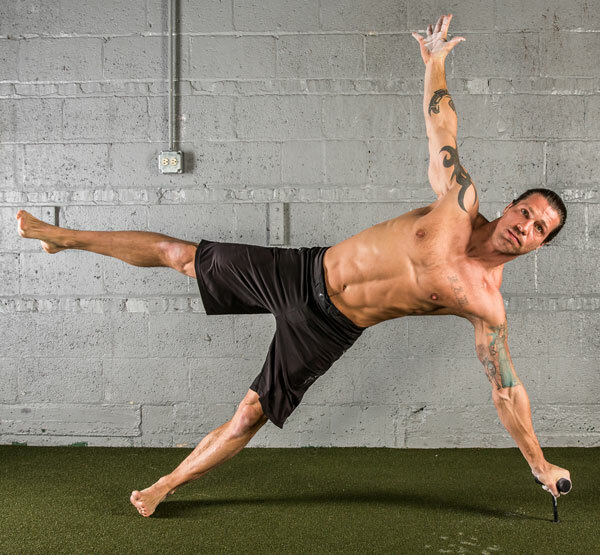 No surprise, then, that Jon Bruney sought ways to intensify the Granddaddy of all bodyweight exercises, the push-up. Jon found a suitably primitive device that was up to the challenge—a nail welded to a piece of pipe. 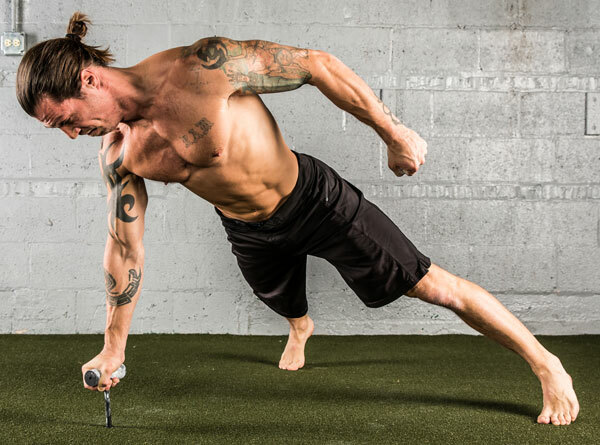 Attempting to stabilize while performing perfect push-ups with this T-shaped tool, was a Man-Buster alright! But Jon felt the tool needed improvement. Let’s make it more durable, cooler-looking AND lighter. Dragon Door has obliged. 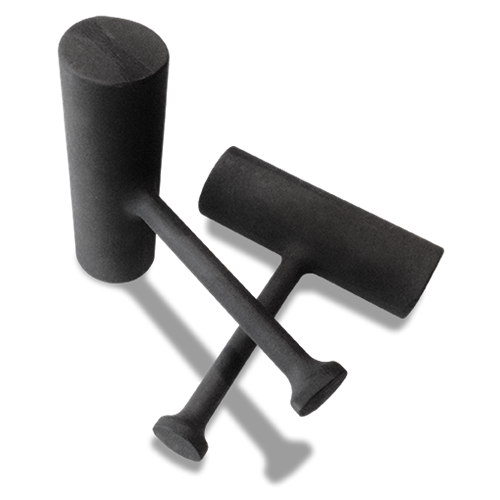 These heavy-industrial steel Neuro-Grips come in a grip-friendly, powder coat finish and will stand up to years of abuse from the most demanding of athletes. 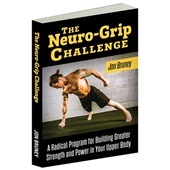 We invite you to take the Neuro-Grip Challenge and reap the rewards! How sure are we that Neuro-Grip will work for you? Simply fill out the form below and put Neuro-Grip to work for you right now. Obviously, we would go out of business if Neuro-Grip didn't work, the way we said, right? With the promise of a full refund if you're unsatisfied, you have nothing to lose by trying Neuro-Grip. Go ahead and try it today. I've been using Jon Bruney's Neuro-Grip Push-up tool for almost a year now. I absolutely LOVE the results that I have gotten with them! I don't Bench Press any longer, I perform various Push-up movements instead. The Neuro-Grip tool has given me a new challenge and has increased the strength of my chest and aided me in rehabilitating my hand. My core fires and my upper body, in particular, my pecs get an incredible amount of work. 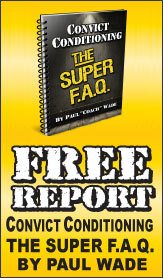 I have my students, athletes and fighters use them on a regular basis. It would be easy to dismiss the Neuro-Grip as an overpriced gimmick that simply adds extra challenge to doing push ups. In fact, it works the entire body - and the mind. Strength, stability, balance, focus, and concentration are all required, with very little room for sloppiness or fear. And that's just to hold a basic plank! If the body becomes loose or the mind starts to drift, a faceplant will quickly follow. Fortunately, the Neuro-Grip is a solid tool that feels great in the hands and is much better constructed than similar products. The price may seem steep for something so basic, but the payoff of developing a stronger mind-body connection (not to mention tighter muscles) is immeasurable. I purchased similar items from elsewhere none of them function with the safety and exercise ability that this item does. When my hands sweat with those previous purchases they became unsafe to use but the Neuro-Grips and the way they are made remain safe for me in my poor estimation because of the quality of how they are made. In my estimation this is another great product from Dragon Door. Just a superior, effective product. I use them as an alternative workout, in-between weight sets workout, or finishers. WOW! Lot a bang for the buck, and I can take them anywhere. I love the effect it has on my Central Nervous System, not to mention the improvement I've made with other workouts. Great product! Rated 10/10 Pushups that work your grip?! I'm going to echo Sean Oneil's review below...the neuro-grips require the focus/presence that DragonDoor promotes in all exercises to the pushup. The only thing I haven't read so far is how much they smoke your grip/forearms while doing PUSHUPS! They have become one of my favorite additions to my bag of tricks. I highly recommend. You have to try them to understand. Being in the military, I do thousands of push-ups a month during Physical Readiness Training. I got to the point where no matter how many push-ups or techniques I did I could not improve my 2 minute maximum which was plateaued at 100. Being a kinesiologist and a collector of body weight equipment, I saw Dragon Door’s Neuro-grips and had to have them. After just a month of training with these I can hit 120 push-ups in 2 minutes unfailingly. My arms and chest have gained inches in addition to my forearm/grip strength becoming immensely stronger. These simple yet elegant pieces of training art are a fantastic addition to my body weight gym and are compact and light weight enough to take anywhere. They have taken my front end muscular endurance to the next level as well as increased my bench max. The craftsmanship and durability coupled with the results I am getting with Neuro-grip training make them worth every penny. NOTE: Once your hands get sweaty and/or the grips get wet it becomes nearly impossible to use them without hulk-like grip strength. My solution for you is make custom grips using athletic tape, chalk your hands, then keep pushing. Just a quick note to say that I received my Neurogrips in the UK this week. I don't think I have ever been so blown away by a product since buying a kettlebell 15 years ago. I had read about them and watched videos. 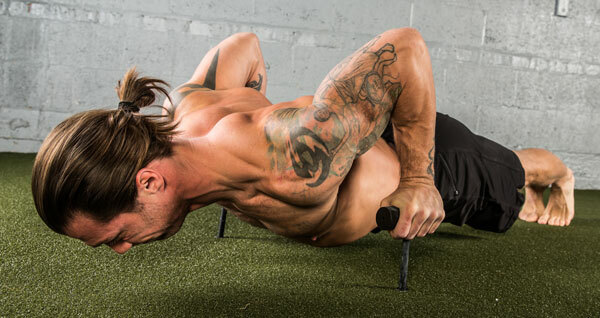 The idea of making push ups harder looked good... But wow they are so much more.. Portable and probably never need to do a bench press ever again. Well done - just amazing ! I purchased these over a year ago and love them. 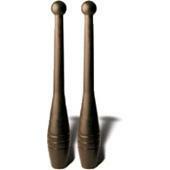 Great for grip/wrist strengthening and even core. If a person doesn't have any injuries or limited range of motion in their upper body, these are a great addition to their workout routine. Excellent for most of my students/clients that are learning self defense. The can be modified with bent knee push ups which most start out with. I wasn't sure about these but after receiving and using them for a month they are a great little tool to have at home or take on the road. The highest quality hardware and well worth the international shipping wait. Get all the benefits of a press up with a fantastic forearms and grip workout thrown in for free.